Fierce Sonia is a multimedia artist who frequently works in obsessive series, often working on many pieces at once; retelling the story over and over much like a folk tale is folded over the mouth many times. An icon in Fierce’s work is the “cow skull woman” image. It continues to balance concepts of hard/soft, morbid/hopeful, life/death and remains decidedly feminine. She is interested in the narratives of the most common and unifying stories: religion, fairy tales, super heroes, mythology, pop culture and advertisement. Fierce’s works are lushly layered with dark sensual mysterious female narratives. Her modern princesses question the beauty standard and embody their own sexual manifesto. 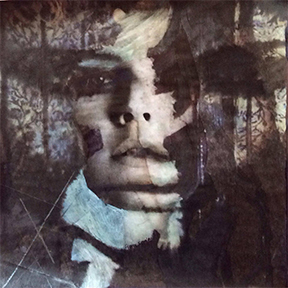 She physically builds a substrate with acrylic paint and collage to print her very personal photographs. Often the images are of her own body. 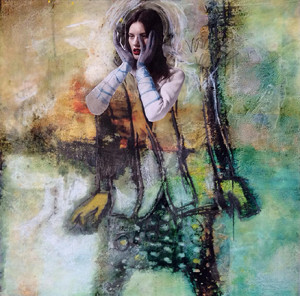 A narrative is constructed by the tension between the layers moving to dreamier feminine mindscapes with a brighter palette. She is becoming an ambassador of happy, emphasizing the beautiful joyful goodness. Her female characters are strong and hopeful. If you listen closely, her work has a soundtrack – a rhythm, a pulse that will give you a magic carpet ride to a lyrical fairytale that restates your own heartbeat. Fierce lives and works in Alexandria, VA, and often has a public studio open at the Torpedo Factory.